We are saddened to announce the sudden and untimely passing of a lovely lady of exquisite taste who made everything around her more beautiful. Dee Dee was born in Elyria, OH in 1944, the third of three girls born to George and Olive DeWald. Her early years were spent in rural family homes on Hawk Road in Columbia Station and Durkee Road in Eaton Township. Dee Dee attended the small Eaton Township Local School. In 1956 when Dee Dee was 11, her parents moved the family to Bath, Maine. Dee Dee graduated from Morse High School in Rockland, Maine in June, 1962. She retained a deep love of the iconic beauty and rugged dignity of the state of Maine for the rest of her life. In 1963, Dee Dee returned to Ohio and met and married Ted Tocarchick in Lakewood, OH. Dee Dee and Ted enjoyed many adventures together before divorcing in 1990. During the early married years, Dee Dee always found time for fun, travelling extensively across the US and Hawaii, and enjoying a time share for many years in Fort Lauderdale. Dee Dee discovered that she had a good eye and real talent for home décor, and developed those talents with stunningly-decorated homes around NE Ohio. In 1967, Dee Dee got a job at General Motors, beginning a long, successful career in administration and marketing for the Pontiac and Chevrolet divisions in Cleveland and later Southern California and Michigan. In the early 1990s, Dee Dee was transferred by GM to Thousand Oaks, CA. What followed was not only a very successful period in Dee Dee’s career but also a new career in real estate investing in what was a hot California market, buying and flipping homes using her prodigious decorating talent to increase the value. In 2000, Dee Dee took early retirement to move back to Olmsted Falls and help care for her ailing mother Olive. They lived in the Columbia Park development where Dee Dee entertained many friends in her spacious home and outdoor porch. After Olive’s passing, Dee Dee felt the lure of the lake and returned to the Gold Coast enjoying the lake view from the 7th floor of the Carlyle. 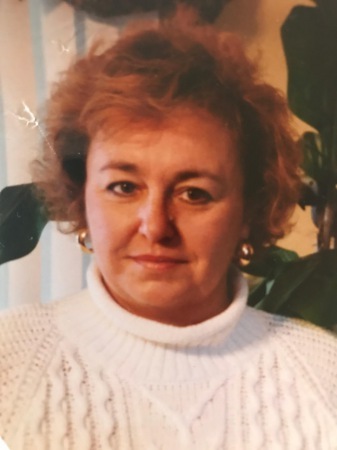 Dee Dee was an avid patron and volunteer with Clague Playhouse, serving as bookholder, hostess for opening night receptions and recipe columnist. She was a member of Rocky River Coterie Club and member since 2003 of an active book club which fed Dee Dee’s love of reading. Dee Dee loved Maine, especially Reid State Park, lobsters, Boothbay Harbor, seagulls, and Portland Headlight. She loved Royal Caribbean cruises, flamingos, birds and elaborate Christmas villages. Her homes were always beautiful, driven by Dee Dee’s exquisite sense of color, juxtaposition, and taste. In her last years, Dee Dee developed a great interest in the great African reticulated giraffe. She was a dedicated sponsor of April and Taj at the Animal Adventure Park of Harpursville, NY. Dee Dee is survived by her two sisters Dottie Palazzo of Westlake, OH and Phyllis Wells of Augusta, ME; Niece Robin Palazzo Whitney (Jim) of Park City, UT; Grand-nieces Grace Whitney of Seattle, WA and Claire Whitney of Los Angeles, CA; Cousins Jeff Rade (Andrea) of Berea, OH and Jason (Stacey) Rade of Strongsville, OH; Uncle John Rade (Barbara) of Sarasota, FL; Nephew Mark (Diane) Albrecht of Aurora, CO and his children Austin, Reece, Tara and Zoe Albrecht, all of Colorado; plus countless cherished friends. She is preceded in death by her parents; her grandmother Florence Eldridge; and brothers-in-law Bob Wells and Ralph Palazzo. Dee Dee died of a sudden heart attack. She was not aware that she had heart problems. Her symptoms were different than male heart attack. Dee Dee’s family urges all women to be tested and aware.